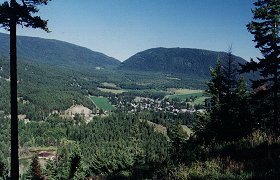 Throughout the province of British Columbia hard rock mining has played an important part in local history for more than a century. Pockets of minerals dot these mountain ranges and over the years drilling crews have put much effort into sampling these sites. The task of a drill team is to remove cores of rock from deep underground at a potential mine site. A special hollow cutting tip carves out a long cylinder of rock, which is brought to the surface and placed in a series of wooden trays. 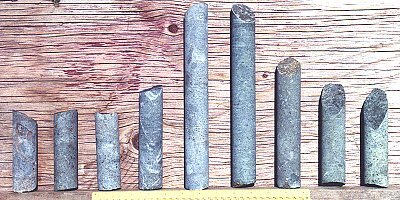 A geologist can examine these rock cores and decide if the pattern and type of minerals shown warrant further testing, or if drilling should be stopped and the equipment moved somewhere else. 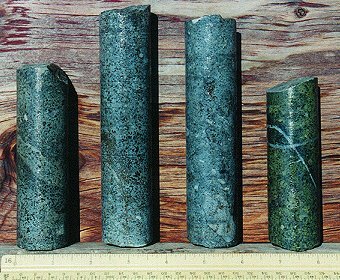 It was once common practice to leave the cores behind after testing was completed - not surprising considering the effort needed to cart rocks off the side of a mountain and costs involved in storage. 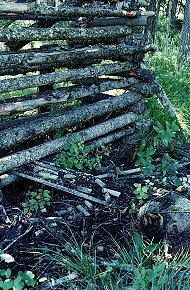 Many of these abandoned sites still have those rock trays sitting out in the open decades after the men have moved on. Many more have been lost to forest fires, landslides, or been swallowed up by the forests. 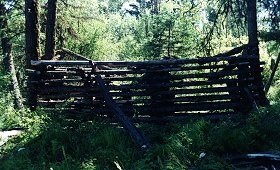 Those that were near towns or roads have generally been picked clean by tourists and souvenir hunters, but there are still others ready to be found by dedicate seekers. 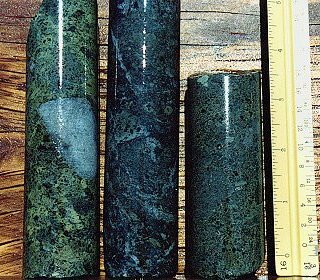 These two images show the differences between raw cores that are wet or dry. The wet look greatly enhances the textures and colours of these rocks, but would be difficult to maintain unless kept in a fishtank or pond. The best options would be to carefully polish the cores to a glass-like smoothness (possible with carbide emery cloth, but very time consuming) or spray with a high density transparent film. These cores presumably do not contain rare or valuable minerals otherwise they would not have been left behind, but they are a little piece of the history of this part of Canada and do make for unusual ornaments. Each core was removed from the earth at great expense decades ago, sometimes from depths of several hundred feet, and are thus one of a kind. Most of the core suites are incomplete and jumbled when I find them, so I have no indication of depth or association to grade them by. 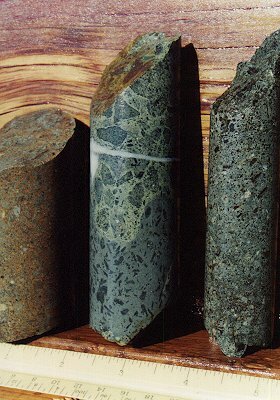 Some rock types have started to crumble after years of exposure to the elements and do not tolerate being handled. 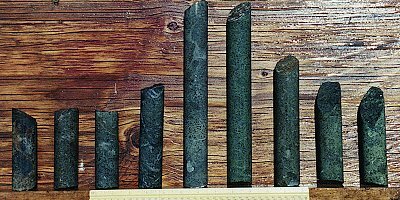 And because of the nature of the drilling equipment used to obtain them, cores do not often come in lengths greater then 10 cm (4 inches). Travel British Columbia, tourism and travel guide.